The first two seasons of the fantasy anime series is planned for Blu-ray in April. 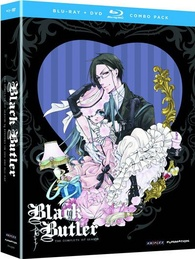 In an early announcement to retailers, FUNimation will be releasing 'Black Butler: Complete First Season' and 'Black Butler: Complete Second Season' on Blu-ray on April 3. Ciel Phantomhive is the most powerful boy in all of England, but he bears the scars of unspeakable suffering. Forced to watch as his beloved parents were brutally murdered, Ciel was subsequently abducted and violently tortured. Desperate to end his suffering, the boy traded his own soul for a chance at vengeance, casting his lot with the one person on whom he could depend: Sebastian, a demon Butler summoned from the very pits of hell. Together, they’ll prowl the darkest alleys of London on a mission to snuff out those who would do evil. They’re a rare sight, these two: the Butler who dismembers with dazzling cutlery – and the Young Master who carries the devil’s marking. Rest assured that wherever they may be headed, it’ll be one hell of a ride. Specs have yet to be revealed, but each release will be a Blu-ray/DVD combo pack and supplements for the first season include: Episode commentaries; The Story Thus Far with Narration from Tanaka (English 5.1 & Japanese 2.0 with subtitles); Bonus episode: His Butler, Performer (English 5.1 & Japanese 2.0 with subtitles); Musician profile with bio information on Becca Textless opening song – Monochrome Kiss; Textless closing songs – I’m ALIVE! and Lacrimosa; and Trailers. Supplements for the second season will include: Episode commentaries; OVA 3 commentary; Outtakes; U.S. Season 1 & 2 Trailer; Textless opening song – SHIVER; Textless closing songs – Bird and Kagayaku Soru no Shijima ni wa; and Trailers. Suggested list price for each Blu-ray set is $69.98. You can find the latest specs for 'Black Butler: Complete First Season' and 'Black Butler: Complete Second Season' linked from our Blu-ray Release Schedule, where it's indexed under April 3.